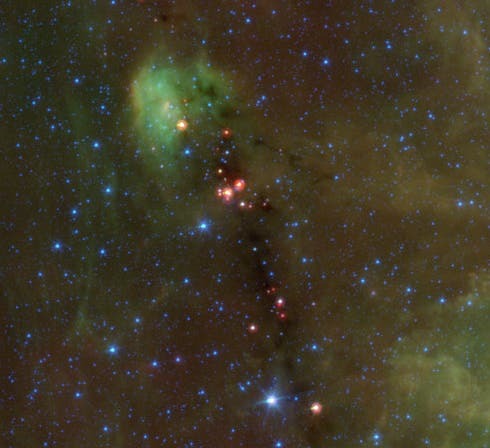 This infrared image shows of a cluster of new stars forming in a dark filament of gas and dust in Cygnu, a northern constellation lying on the plane of the Milky Way that contains the X-ray source Cygnus X-1, which is now thought to be caused by a black hole accreting matter in a binary star system. Stars form as gravity coalesces the gas and dust in interstellar clouds until the material produces clumps dense enough to become stars. But precisely how this happens, and whether or not the processes are the same for all stars, remains very uncertain. Astronomers have been studying very young clumps, called "pre-stellar cores" located deep within stellar wombs, in an attempt to sort out these details. But precisely because the cores have no stars in them yet, or at best only very young stars, they are faint and difficult to observe. Astronomers at the Harvard Smithsonian Center for Astrophysics have come to realize that birth clouds are most often filamentary in shape, not spherical, and so the team examined a suspected embryo embedded within an (even colder) filamentary cloud. They selected a filament that is relatively close by, only about 400 light-years distant, and that was known to contain within it a string of warm spots that might be stellar embryos. The scientists probed one of these spots using the millimeter wavelength emission from its dust and from two simple, nitrogen-bearing molecules that are known to trace the dense gas expected around a pre-stellar core. The team's results include the first high spatial resolution observations of such a young core. They conclude that the material is apparently collapsing, and that the object's mass is about 0.29 solar-masses (that is, it would make a star smaller than the sun). The core currently extends over about 1000 astronomical units (in the solar system this dimension reaches to the inner zone where comets reside). Overall the new results are notably different from the predictions of simple theory, suggesting that this core has been significantly influenced by fragmentation of the filament and by the presence of other cores in the cluster.